Unique is one word to describe this intriguing video slot from software giant Play'n Go. Gemix features an unusual layout of 7x7 reels and you win by forming clusters of symbols rather than landing on paylines. In many ways it’s more like a mobile game than an online slot as you pass through different worlds. 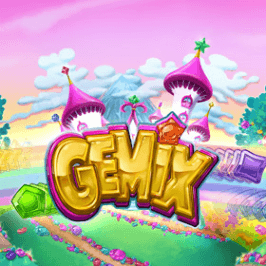 Gemix is certainly not your average slot, so let our review guide you through it and explain what makes it stand out from the crowd. Gems have been popular in gaming since the off, and many classic slot machines use gems as symbols. Now, Play'n Go has managed to make an innovative slot all about gems that combines the fields of gaming and casino. When you open up, there’s a brief introductory video followed by a graphic showing you the main features of the game. Then you’re transported into the colourful fun world of Gemix, with its 7x7 grid of eight different gems in all sort of colours. The background music is a little repetitive but as you pick up wins and go through different levels of the game, the sounds change for a bit of variety. There are no paylines or coin values in Gemix so all you have to do is set your bet. The minimum bet is 50p and the most you can stake is £100. The way the symbols drop onto the screen is not typical either. 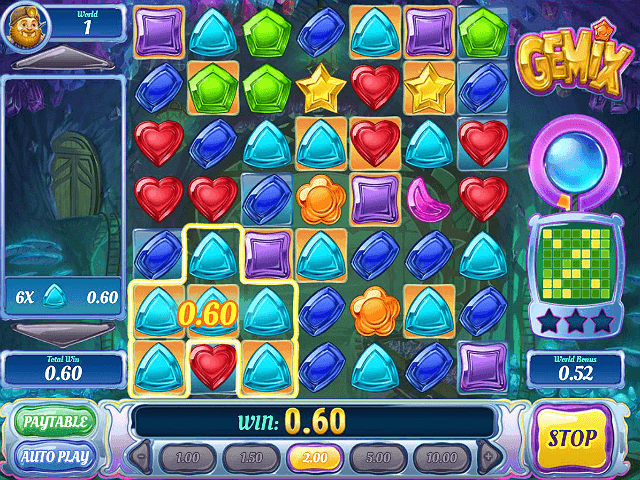 The gems drop from above to populate the squares on the grid rather than spinning. You’ll see that some squares are highlighted; we’ll tell you more about what these patterns mean in the next section. To win on Gemix, you have to form clusters of symbols – that is, matching symbols that are touching each other. The bigger your cluster, the more you win. The yellow star is the most lucrative symbol on the grid, paying out 500 times your stake if you get 15 or more of them in a cluster. Every time you win, the winning symbols are removed and symbols fall down to fill the gaps, similar to the cascading reels feature that you get in some slots. 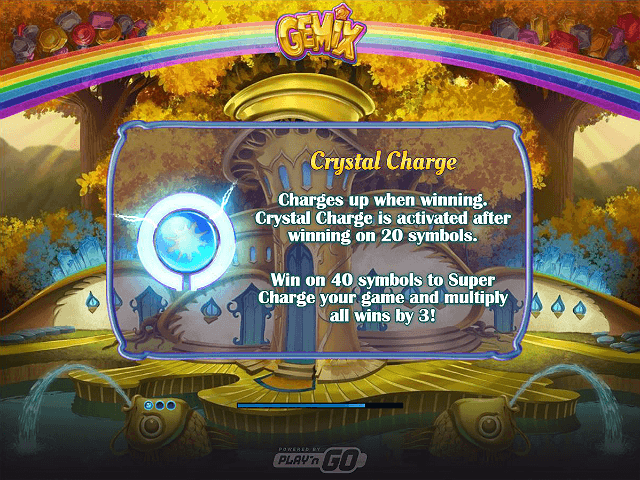 If you do even better and get a cluster of 40 or more symbols, this feature becomes Super Charge and all wins from the four bonuses are subject to a 3x multiplier. The chances of you activating this feature are admittedly slim, but if you do you should be in for some big wins. As mentioned, there are also different worlds in Gemix. 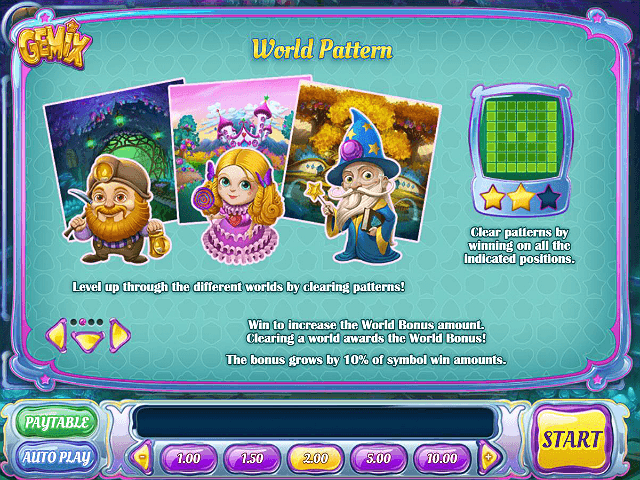 You progress through the three worlds by landing matching symbols in the patterns denoted on the grid in each one. Each world has its own World Wild symbol, which substitutes for all symbols. The various features in Gemix can read complicated at first, but once you start playing they become quite clear. These features can also bring you some handsome wins, drawing it all together to make a truly unique slot game. If you like Gemix - You'll like these slots too!